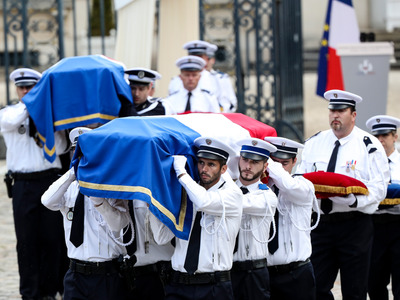 Kamil Zihnioglu/AP ImagesPolice officers carry the coffins of the two police officials killed by an extremist claiming allegiance to IS, during a ceremony, Friday June 17, 2016 in Versailles, near Paris. Keeping track of individuals who sympathize with terror groups like the Islamic State is proving to be a daunting task for law-enforcement officials around the world. France, thought to have the most ISIS loyalists in Europe, might be having the toughest time of all, a New York Times report revealed Tuesday. The report highlights the case of Larossi Abballa, who pledged allegiance to ISIS in a Facebook Live video shortly after killing a policeman and his partner at their home outside Paris last week. Abballa had been on French officials’ radar for years, but had no connection to terrorism for police to act on. He committed the murders just weeks after police wiretaps on him had ended. “It’s very easy retrospectively, with hindsight, to say that law enforcement, or government, should have known about someone’s intent,” Richard Walton of the London Metropolitan Police told The Times. Part of the problem appears to be structural: France’s database of people believed to be radicalized contains more than 10,000 names and is not ranked according to threat level, The Times noted. The US is facing a similar problem in the wake of the mass shooting in Orlando that killed 49 people. The attacker, Omar Mateen, pledged allegiance to ISIS in a 911 call he made during the massacre. Like Abballa’s interactions with police in France, Mateen had been on the FBI’s radar over the course of several years. Ultimately, sifting through hundreds of potential terrorists to find a credible threat can be like “looking for needles in a nationwide haystack,” FBI Director James Comey said after the shooting.